I’ve just returned from a screening of “Queen of the Sun” here in Nashville. It was a great documentary and I encourage you to check it out if it comes to your town. To me, the take home message was that we all need to practice sustainable beekeeping practices from now on. It’s a message that I feel us “slow-beekeepers” have been trying to promote for quite some time but haven’t had a big enough bullhorn to use. “Queen of the Sun” might be that bullhorn. Another clear point in the film was an exposure to the sorry state of our queen bees today. The movie compared them to our cattle or pigs that are so weakened they need help just to stand up and be fed. While our queens are still able to crawl and lay eggs, I can’t agree more about how broken the industry appears. It’s also the aspect of the beekeeping industry I think you and I can make the most immediate difference. 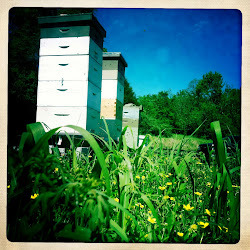 The more we learn and raise local queens of our own, the more dynamic and stable our apiaries will become. ***Special Note*** It is worth mentioning, there are many variations to raising queens. In my opinion, this is the simplest, least risky way of trying out queen rearing. One could argue that you’ll get better quality queens if you move the original queen to the nucleus hive and have the parent colony (the one with the most bees) raise a new queen. If you don’t care about honey production, this might be the way to go. Play around and see what works for you. The best part about it is you’ll know within 3 weeks if you’re a success of not. This is the second year for my bees. Williams Honey Farm caught me a swarm last year. This year alone they split on their own at least 4 times. The last time we were prepared with a new commercial hive and caught the swarm. They seem to have adapted to their new home quite well. This year we were able to get a total of 1 1/2 gal of honey. Not bad for a free swarm and a homemade topbar. Oh and chemical free bees as well! Look for Grace Haven Farms Honey, Goats milk and soap in the future.